Farrar, Straus and Giroux (BYR), 9780374306168, 40pp. We've all heard of the Itsy-Bitsy Spider right? But have you heard of the the Hugely-Wugely Spider? He's just like Itsy-Bitsy except he's a little—no—a lot bigger. The Hugely-Wugely Spider went up the water spout, well not really, because he wasn't invited by the other spiders. And maybe because his size was bit of an issue . . . But that didn't stop him from trying. The Itsy-Bitsy Spider and his friends get into a bind when down comes the rain and threatens to wash them out, and only the Hugely-Wugely Spider can save them. With his quick thinking and huge thorax, Hugely-Wugely clogs the drain and saves the day. Ethan T. Berlin is an Emmy Award-nominated comedy writer and performer who has written for some of today's top comedy voices and networks. He teaches comedy writing classes at NYU and the Peoples' Improv Theatre. 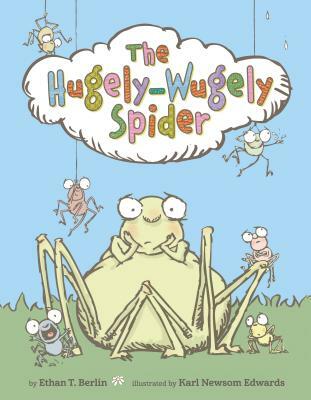 The Hugely-Wugely Spider is his debut children's book. Karl Newsom Edwards is a children’s picture book author and illustrator. Born in Oakland, California, he is a graduate of the California College of the Arts with a degree in drawing. He made his debut as an author/illustrator with Fly! He lives in Portland, Oregon.